The city of Spokane sure loves hockey — and rightfully so — as the sport has been present in the Lilac City for 100 years come January. On December 19 against the Portland Winterhawks, the Spokane Chiefs will honor the city's first hockey team, the Spokane Canaries, with throwback replicas of their 1916 uniforms. Lacking photographic evidence of the Canaries' getup, the "faux-back" design for the retro jerseys is a creative interpretation of what they may have looked like. Facing the brutal clutches of Spokane winter, the Canaries lasted only one season as members of the Pacific Coast Hockey League, posting a record of 8-15-0 during the 1916-1917 season. Nonetheless, the team pioneered professional hockey in Spokane, playing in the city's first hockey rink—an outdoor rink in northwest Spokane. With expensive ticket prices for the time (50c cents - $1) and an outdoor arena, the team realized its lack of staying power and disbanded at the end of their inaugural season. The Canaries' home rink was located near the corner of North Elm Street and West Maxwell Drive, where there is now a ball field, tennis courts and a swimming pool. 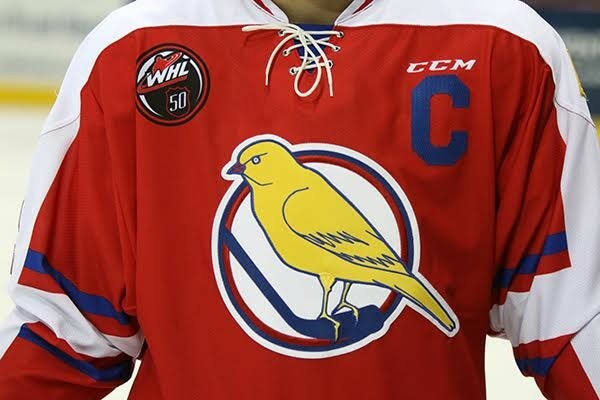 The jerseys, primarily red with a prominent yellow canary on the chest, will celebrate more than hockey in Spokane, acknowledging the 50th anniversary of the Western Hockey League as well. The old-school jerseys are one-of-a-kind and will be auctioned off throughout the game. The Spokane Chiefs take on the Portland Winterhawks at Spokane Arena on Saturday, Dec. 19, at 7:05 pm. Tickets can be purchased online at TicketsWest or by phone through the Chiefs' ticket office at 509-535-7825.